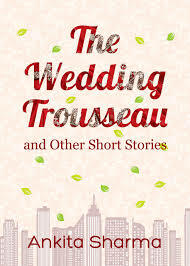 The Wedding Trousseau and Other Short Stories is a collection of short stories that represents different elements of life. They are easy to connect and relate. These stories remind us of different phases that we go or relate in our life. Ankita Sharma has crafted the stories in such a way that all the stories are intriguing and her knack of connecting with the reader is marvelous. Through this anthology she has infused and provoked some thoughts that the readers could ponder. We talk big about equality in our country but there still are divides that happen that distinguish people on the basis of statuses. One More Bite highlights this fact. Leaves talk about the story of a young boy who has a hard time making pple understand something different from their old perceptions. Curse will make you relate to stories that you have been hearing around your neighborhood. A story of a son and a mother who happen to curse his wife for the reasons known! To know the reason , read the book. I'm sure you must have heard such stories nearby! Courtesy , The Solitary Mound, I Forgive You are light stories that deal with emotions and are philosophical too! The Wedding Trousseau talks about the life of a girl who dreams about her marriage and who is excited about her life after marriage. But dreams remain dreams when she learns that her marriage life is dry and sad. A busy husband who has no time for his wife and an affection craving wife are few stories that we all have been seeing in movies. Such stories do happen in reality too. The Site Visit, is a spooky story of a young professional who wants to rent out a home only to find out the truth later about the owners of the house. Indeed Spine chilling! The Fresh Stock is a take on adoptions. People who adopt children at orphanages should be kind enough to adopt kids not on the basis of their color or size. Kids are the virtual representation of God and accept them no matter what. This story talks about the same. The best of the lot is 'Just Perfect' . This is something that I loved. It gives a very good message. No one is perfect in Life. Learn to be happy with little things that we have. It just gives a perfect end to the collection. "Perfection keeps shifting like a mirage. We are obsessed with anything that is perfect but the standards shift every minute; they are not fixed. We refuse to accept and agree with anything that fails to fit inside our moulds of excellence. " If you are planning to chill over the weekend then this is the right book. Ankita Sharma is adept and a very skillful writer who knows how to play with emotions. The job of a writer is to make a reader visualize the characters in front of their eyes and I think that Ankita has done her job well. The language and the narration is simple and it establishes a good connection among the readers. The best part is that every story has some value to offer and the readers could relate with it. I highly recommend this book. These are stories that could be narrated to your kids. Better gift them this book! The stories suggest that the writer is an observer. Anyone who pens stories that touches the heart and that talks about emotions need to be a good observer. Only a good observer can produce such realistic stories that have deep impact on the minds of the readers. I give 4/5 for the stories that are not new but for the easy connect that it has to offer. Readers can relate to it and share these stories with their loved ones. This is a perfect debut for any writer and after reader this I would want to read a complete novel from her. I am sure that day would arrive soon. Ankita Sharma is an entrepreneur based in Faridabad. She is passionate about reading, writing and sketching. Her sketch works have appeared on the cover pages of few titles. She loves nature and is very fond of animals. She blogs at www.hummingwords.blogspot.in. Thanks a ton dear for such a lovely review! I am so glad that you enjoyed the book!!! Each story reflects the different sides of the human psyche and also shows the diverse shades of the human relationships. Some of the stories will make you think of our society and their narrow thinkings, some stories would teach you a few nice and motivating lessons, while some stories are just a simple read for fun. The novel can be relished by any age group readers.